Jason walked down the beach slowly, purposefully, swinging the metal detector back and forth in rhythmic four-foot arcs, covering every square inch of sand. The steady tone in his headset assured him he was missing nothing. Jason had been hunting for buried treasure since he was a little boy, digging holes in his backyard despite his mother’s firm warnings, turning over every interesting-looking rock, reading endlessly about pirates and their treasures. He discovered beach combing with his wife, and they spent every vacation at beach resorts. 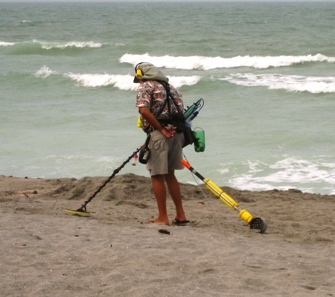 When his wife died and he retired, he bought his first simple metal detector and was hooked on the hobby. Now he held a top of the line White’s Spectra model, a considerable investment that had almost finished paying for itself in the eight months he had owned it. It was like another pair of eyes to Jason, probing several inches into the sand for the valuable secrets that lay buried there. His ear was attuned to the slightest change in the detection tone; he could quickly identify and dismiss such junk as bottle caps and pieces of foil. He almost never stopped to dig without finding something interesting. He had been searching for several hours this morning, methodically working back from the low tide mark. Suddenly he paused and swung the detector back, narrowing the arc until it was hovering exactly over the source of the strong signal he was hearing. Keeping his eye on the spot, he grabbed his sand rake and dug down several inches to reveal a large coin. Jason picked it up and examined it closely. It looked nothing like the gold doubloon he had found last year. It was definitely not gold or silver. It was quite hard, and had a faint bluish tinge. It didn’t look tarnished, but he rubbed it between his fingers to see if the blue color rubbed off. The coin quickly grew warm in his hand and began to emit smoke. Startled, he dropped it and watched as the smoke grew thicker and condensed into the form of a rotund man in a sequined robe and a fez. “Isn’t that supposed to be three wishes?” asked Jason. “Yes, more riches than you can imagine could be yours,” replied the genie. The genie waited while Jason thought some more. Finally, he grew impatient. “OK, then, you decide for me,” Jason said with relief. “Very well,” said the genie. He waved his hands and the coin rose up from the sand into the air. He clapped his hands together around it, held them for a few seconds, and then opened them with a flourish. The mysterious coin had vanished. Slowly, the genie began to fade from sight.